We always love to hear from our customers and especially enjoy when we get to see the finished project that our engines and a part of ourselves went into. When the dream of a first street rod started to become a reality in 2009 I looked at a lot of options for the engine, and the many, many "crate engines" that have flooded the market. I read several stories about "crate engines" that were really just mass rebuilds from no-name shops - minimal machining, no attention to torque specs, and even cases of rod caps left loose in oil pans, and I was concerned with spending good dollars for junk. It became apparent that I either needed to be ready to pull the new engine apart and check clearances, deck height and torques, or I needed to find a quality machine shop that I could trust to build my small block Ford right. I'm thankful that I found Sehr Performance in an internet search, and that I called them to talk about my wants and needs. Scott understood my desire for reliability first, but solid performance and efficiency at the same time. After talking about his standard "crate engines" we started looking at options and discussing the value of the changes that he thought would be good. It did not take long for me to realize that this was a guy that I could trust, and a guy that would be there for me down the road. We ended up with a Ford 347 stroker that sounds pretty wicked and has more power than a sane man would ever need, but its an amazing rush to punch it in any gear above 2000rpm and feel the torque set you back into the seat. I recommend Sehr Performance to anyone that asks, and will be going back to Scott Sehr if/when I get into another build. ...Sehr Performance are good folks who know what they're doing, and you can trust them to follow through. This is my 55 Chevy 210 2 door, post. The car was purchased 5 years ago in Denver and moved to Victoria BC on the west coast. Thanks to Sehr Performance that built the high performance 383 Stroker, this car is not only a reliable driver it's also a pretty fast 55. With a 700R4 trans you can smoke the tires right into 3rd gear and then cruise at sixty five miles an hour all day long. This car is no trailer queen, it has made numerous trips to Puyallup Washington for "The Good Guys Show" and also Pleasanton California and many more to come. Thanks to all the staff at Sehr Performance for building a quality product, keep up the good work and thanks. Thanks for building an awesome supercharged 383 SBC for my 1981 Trans Am. First pass ran a 9.86 at 135mph and it's totally street legal. I look forward to doing business with you soon! 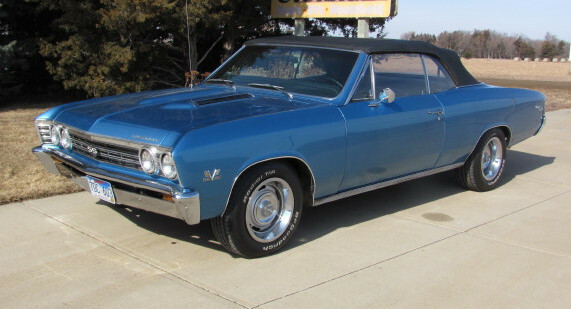 We installed a Sehr built 454 big block in my 1967 Super Sport Chevelle convertible. The motor is designed to my specs to run on 92-octane pump gas. It was designed for everyday driveability and to develop significantly more horsepower than the original motor. At 589 horsepower this car was built to run with the occasional supercharged Shelby Mustang and Z06 Corvette and to blow the doors off of the new 425 horsepower SS Camaros and SRT Challengers that wannabe racers buy. Scott has gone the extra mile to insure this motor runs correctly after performing all the machine work and extenstively dynoing the motor. I took a load of small block Chevy parts to Sehr Performance, they looked everything over and we used my .060 over 350 block. We talked about what I wanted to do and made a game plan for a 383 stroker motor with a new lightweight steel crankshaft, 6" forged "I" beam rods, Icon forged pistons, King race bearings, new hydraulic roller cam, lifters, springs, retainers and locks. Using these new parts Scott went through my iron heads replaced some bent valves and the machine work began. Scott put the engine together and mounted it on their dyno to break it in and tune it. It made 721 Hp and nearly 650 To. 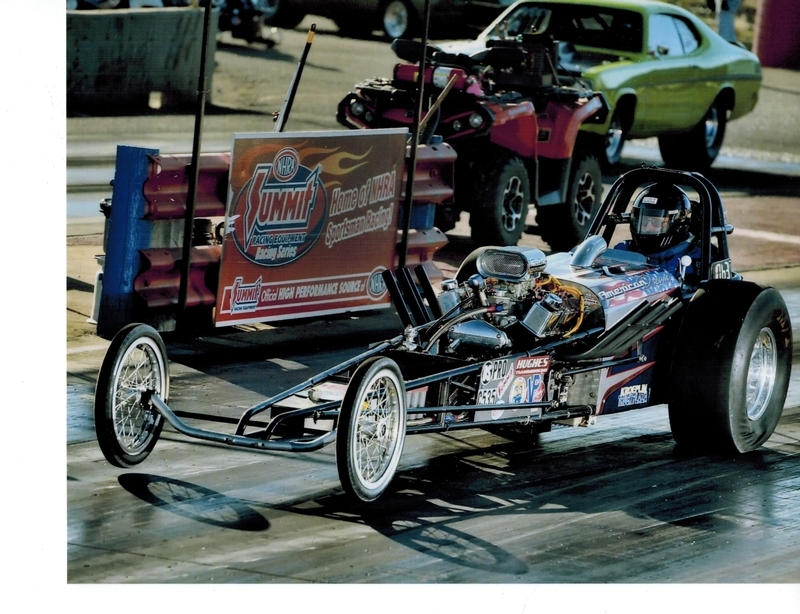 I put the engine in my 1760 LB front engine dragster that I launch at 3000 shift at 6000 and go through the traps at 7000. The car runs in the low 9 sec. range. With 95 passes on it I have to say the boys at Sehr Performance built an engine that is awesome, runs like no other and it was tuned so all I had to do was put it in & play. With some transmission and converter work that Scott suggested I hope to get into the 8's. I would recommend Sehr Performance Machine to everyone that is in need of a engine, they know what they are doing, and Scott's quote was right on the money. When I brought my crate 350 into Scott, with well over 100,000 miles on it, it was smoking, and very low on the power. The low power thing was a factory 180hp, which would hardly fight it's way out of a wet paper sack. During the teardown, it was found that both heads were cracked, and it was due for a bore. With new heads, a .030 bore, new flat top pistons, and full balance, the numbers were a pleasant surprise, to both of us. 385lbft of torque, and 347hp on the dyno. Scott and Dave are good guys to work with, and very up front about parts needed, along with very detailed explanations. When I need another rebuild, next time to a big block, I will definitely be taking it to Sehr Machine. I am the proud owner of a 1967 Pontiac GTO that I bought as a shell 11 years ago. I wasn’t sure if I would ever get it together and be able to drive it. With understanding and help from my wife, brother-in-law, two sons, a son in law, nephews and grandsons Nick and Parker we got started and did get it back on the street. It wasn’t running as strong as I thought that it should so I called Scott at Sehr Performance Machine and asked some questions. He asked me bring it in so he could check it out. He looked things over, asked some questions and advised that a different intake, carb, and distributor would wake up the beast that was hiding in my 428. Wow; was he ever right. Thanks to everybody that helped get my project back on the street and turning heads. 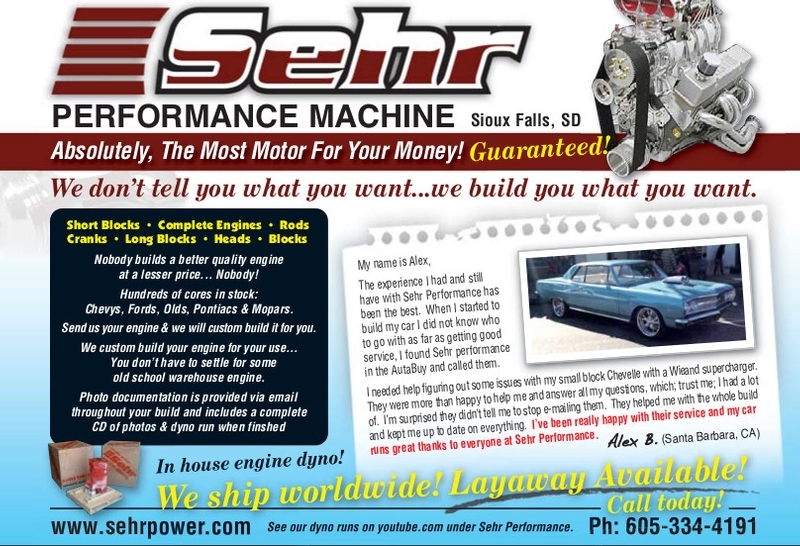 In the spring of 2010, Scott and the guys at Sehr Performance did the engine work on the restoration of my 1965 Pontiac. The engine is a 389 tri-power. Scott and his staff did a great job on the engine and I am very happy with it. The power and the sound of the engine are great and it looks awesome to boot. Scott kept me informed throughout the overhaul process and sent pictures as he went and provided a video of the dyno run at the end. Scott also provided good advice up-front. Scott was always available and willing to make tune-up tweaks to the engine after I had it back in the car – free of charge no less. Scott also worked extensively with the vendor in Illinois that I purchased the tri-power unit from to get everything to work right. I feel welcome anytime I stop by the shop and they appreciate my business. I had always heard that Sehr Performance was the best place to go and my experience confirms why they have such a great reputation! As Scott said to me, “I care just as much about that engine as you do”. How many times do you hear anyone stand behind their work like that now a days. Thanks for the great work Sehr Performance and helping me make my 30 year dream engine come true! I went to Sehr's only with the intention of getting my original block and engine parts cleaned up to go back in the old Scout. After talking with them few a few minutes I could see that this was a shop that I could trust to bring that old engine back to as good as new. Heck, I even had them paint it after they were done. Now I have and engine that runs like it did when it was new. It has been a long time since that old girl has run like this. I am very pleased with my choice to have it all done with Sehr! They walk you through each step of the process. They give you the options available along the way. And they explain what those options will or will not do for you. I wanted the rebuild to be good enough to last for the remaining life of the Scout. I really believe that is what I have. And Sehr's doesn't stop at the rebuild. They made it very clear that if I have any sort of problem with the motor all I have to do is let them know. They will help do whatever it takes to make the customer happy, and keep them that way. I recommend Sehr Performance Machine for any rebuild, whether it's for the family car, a racing engine, or even an engine for your old Scout! The head work done on my 2004 98inch Ultra gained 38-40 extra foot pounds of torque starting at 2300 rpm with 83ft lbs and continues on up to 102 lbs. @ 4000 rpms and flat lines from there up with 43 horse over my stock engine. As a Harley builder for over 15 years it's been a new experience to find a machinist who listens to what I want and helps develop a plan to get it done. You have done excellent work in the porting, bowl blending and finding the right valves for the combination of cam, throttle body and exhaust. I've been very happy with the way you listen to what I have to say and what I'm thinking and then adding your input. A relationship has developed over that last 3 or 4 years has been a great find. I'd suggest that those Harley 'Dresser' riders out there who aren't happy with their torque to get in touch with me or Sehr Performance and we will put some new life in your ride.